God loves me. Want to know how I know? Because he does such a great job at keeping me humble. Yep. Every time, I think I have things figured out or start to feeling really good about myself he knocks me down a peg. Every time I start getting cocky, He makes sure I trip and fall flat on my face. Starting last week, I have a sure fire way of keeping humble. I started the CrossFit training program. I think this program can make the most athletic jock feel modest. But take a 38 year old, over weight, out of shape guy who's main diet consists of McDonald's and thirty minutes later you have a puddle of goo. Throw in the fact that I'm doing the "puppy" level of the workout and you have a guy who feels like he's been thrown down the stairs and into the basement. Fortunately, I have two things going for me. The first is that I can't feel my spiritual pains because I feel like my lungs are going to explode, my legs barely support me anymore and I'm trying to keep my lunch down. The second thing is that I'm doing the program with a great group of people. The instructors and the other people going through the program are wonderful and really keep you motivated. I don't really need CrossFit to keep me humble though. I have a wife for that. Oh, she does a great job of loving me and making me feel special. But she is quick to point out that I need a shower, my eye brows are out of control or that I need a mint. I expect she does that because she figures I'm going to embarrass her by saying something stupid so I might as well look my best doing it. Even without CrossFit or Abby, there are things flying at me every day to humble me. It may be work, or kids or even my spiritual life that reminds me that I have a lot of improvement to be made. It's okay though. Every time I am humbled, I am reminded that God loves me. You see, God, the creator of the universe humbled himself to show his love for you and me. God--who is has always existed and who will always exist became human flesh and blood for you and me. He suffered a horrible death by being beaten and whipped and flogged and finally being hung on a tree so that we may have eternal life in him. 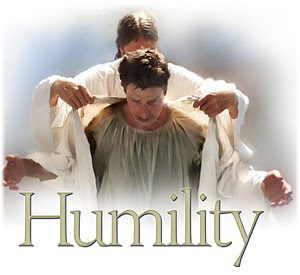 So if we are to imitate, Christ, we must be humble ourselves. That is pretty amazing if you think about it. God loves me enough to humble himself so it shouldn't be anything for me to be humbled. I'll remember that tonight when I feel like a sword has pierced my side. How about you? How has God humbled you lately?? Hi Jamie - great post. How has God humbled me lately? One of my New Years' Resolutions is to read the Gospels again... This time, I hope to gain new insights into how God is calling me to grow. By this standard, I have LOTS of work to do (with God's help).